10 Scary Ways Climate Change Is Impacting Your Health ! There’s a lot more at stake than the loss of some beach real estate as we battle with climate change. In fact, no matter where you live, you’re experiencing the effects. 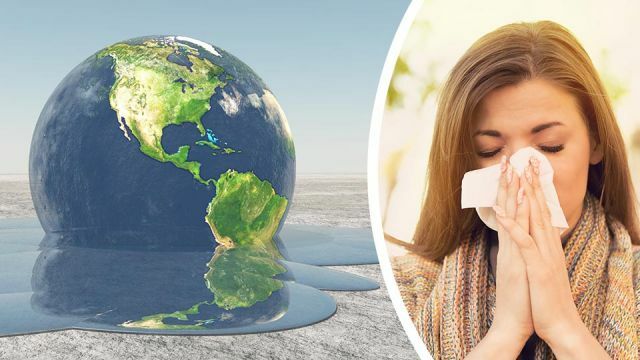 Whether it’s increased seasonal allergies, more aggressive diseases, or living in a flood region that used to be arider, we are dealing with the effects of climate change across the globe. Researchers are concerned about the future as disturbing health trends continue to emerge as a result of changing temperatures and weather patterns. Here’s what we’re dealing with and what we can expect in the future. Have you noticed that you seem to be sneezing more often these days? It’s not your imagination; it’s climate change. Pollen season starts earlier these days, with high levels of pollen starting in early January as opposed to a more traditional springtime. There’s also something called super pollen, a scary byproduct of climate change for those who suffer from allergies. Super pollen is larger and more allergenic than normal pollen particles. It sticks to tissues much easier, so it can remain in our respiratory systems for longer. It’s also more difficult to remove from clothing, fabrics inside our homes and even our cars. Mosquitoes, which carry West Nile virus, ticks that carry Lyme disease, and even rats that carry the plague — yes that plague — experience lower die off rates these days. Not too long ago, winter killed off these pesky disease-spreading critters, but in recent years, fewer die over the cold months, leading to increased populations and wider distributions of these carriers. Places that were previously immune to insect-borne illnesses, like West Nile and malaria, are experiencing increased rates of the diseases. This one is so obvious, it practically goes without saying. From intense hurricanes to bomb cyclones, more devastating forest fires boosted by stronger winds, to the deluge of the Seine River that put parts of Paris out of business for several days, our weather is growing in severity. With these more intense weather patterns, we see the spread of disease through unclean water — as in the aftermath of a hurricane or the decimation of people’s homes during fires. The effects of some of these disasters are worse than the event itself. The World Health Organization (WHO) reports that we are experiencing an increase in established and newly-circulating infectious diseases like hepatitis C, SARS, HIV/AIDS and hantavirus as a result of climate change. Contact with contaminated water, flooding of sewage systems during a flood or hurricane, and increasing temperatures help vector-borne and water-borne diseases thrive. The risk of contracting malaria, for instance, increases five times in the year after an El Niño event. Cholera risk increases anytime humans are exposed to contaminated water — even in urban areas. When people are exposed to animal vectors like ticks, mosquitoes and rodents, everything from Lyme disease and malaria to hantavirus become more likely. People who live in warmer climates will likely see more cases of heatstroke in their area, while colder regions may see more vulnerable populations succumbing to hypothermia or frostbite. That’s due to the increased concentration of greenhouse gases around the world that cause an increase in average and extreme temperatures. Not only that, but exposure to hot temperatures coincides with more hospital admissions for those with kidney, respiratory and cardiovascular disorders. The U.S. Global Change Research Program estimates that chronic health conditions may become complicated in the future by changing temperatures. For instance, Alzheimer’s patients and others with cognitive impairments are vulnerable to extreme weather. With an increased rate of adverse weather events, it’s expected that even more of these patients will need help evacuating during emergencies. People who live with asthma experience exacerbated symptoms from super pollen, rising temperatures, humidity increases and other allergens in the air. Diabetes and heart disease patients experience an increased sensitivity to heat, and people with disabilities may find it harder to evacuate more frequently during adverse weather events. Brownouts and blackouts are an annoyance that most of us have experienced, but in hospital situations, they’re life-threatening. Rising temperatures can add stress to our infrastructure, crippling both medical facilities but also transportation systems. According to researchers in Canada and the UK, harvests of cereal grains including wheat, maize and rice, decreased by an average of nine to ten percent during heat waves and droughts from 1964 through 2007. North America, Europe and Australia were the hardest hit during these extreme conditions. Other studies show that children are experiencing stunted growth and are wasting at an increasing rate. According to the United Nations World Food Programme, children born during a drought in Niger are twice as likely to experience malnutrition between the ages of one and two years old. The UN also estimates child malnutrition and global hunger to increase by 20 percent by 2050 due to the changes in our climate. People’s stress levels increase during times of extreme weather. Even those who are geographically distanced from a hurricane experience the anxiety over the people caught in its path. Anxiety, depression and suicide become more likely during times of drought, floods and drastically cold weather. Small island nations are at risk of losing their freshwater supplies as temperatures increase. When sea levels rise, freshwater gets forced above ground. There, it’s susceptible to evaporation. Lakes can expand, which in turn increase levels of evaporation that can also swallow up small parts of the land. Without enough fresh water, agriculture is at risk and undernutrition becomes more likely. It also means that some areas — like some Caribbean islands — become less desirable for tourists. That’s bad news for places where the economy is almost entirely sustained by tourism. Without it, the local economy is more likely to fail. These health impacts and more are why legislation and improved industry standards are so important. On a personal level, though, it can feel overwhelming. Eat whole, unprocessed foods and practice mind-boosting activities, like yoga and tai chi. Use insect prevention measures and keep your skin covered during the summertime. Look out for your neighbors and older family members when the weather gets exceedingly warm or cold. You can also contribute to charitable organizations that help vulnerable nations and communities. Together, perhaps we can weather the effects of climate change. What do you think about the impact of climate change on our health?